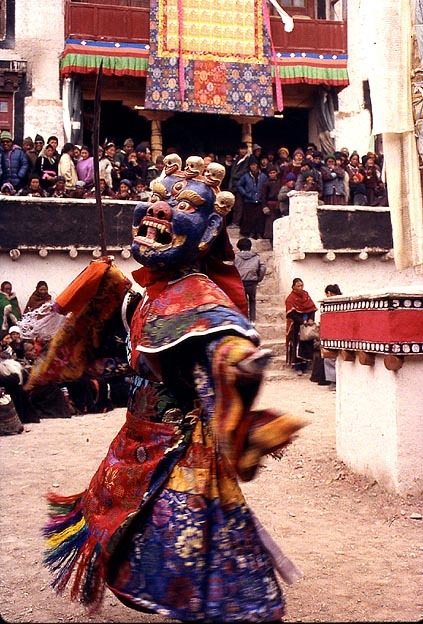 Once upon a time all Cham Dances at the monasteries, except Hemis, had taken place during the Winter. 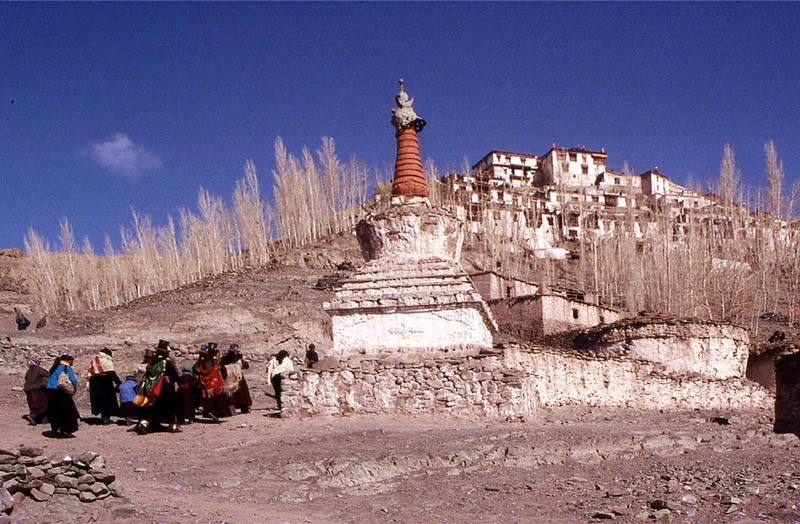 Now more and more monasteries have followed the success of Hemis Gompa in attracting tourists. Because of the decline of the local village communities, tourism has become the primary source of income for the impoverished gompas. 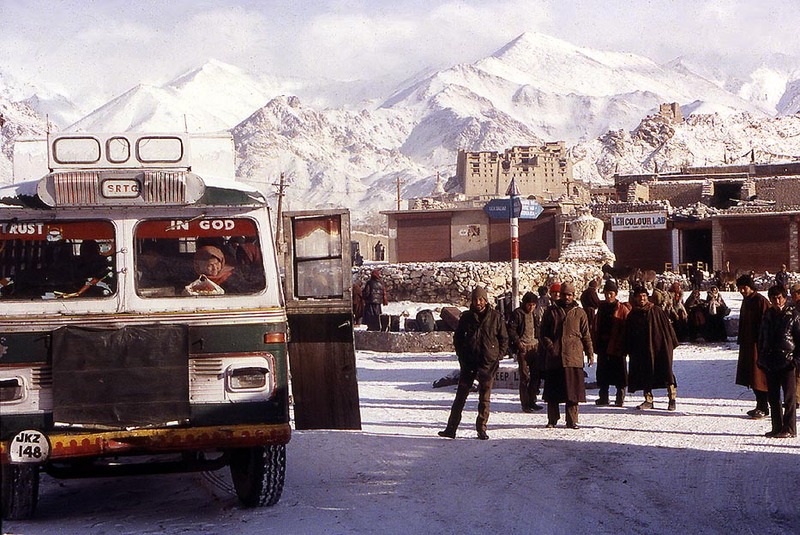 And tourists don't visit Ladakh in Winter — we were two of maybe twelve foreign tourists in Leh — which was the second reason for going to Ladakh in February. 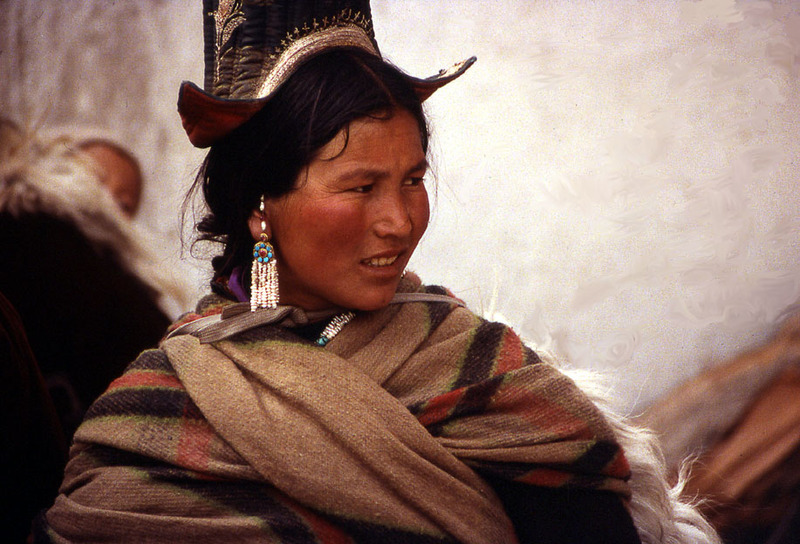 The third was that I had seen most intriguing photographs of the oracles appearing during the Cham Dances at Matho and Stok in mid-February. 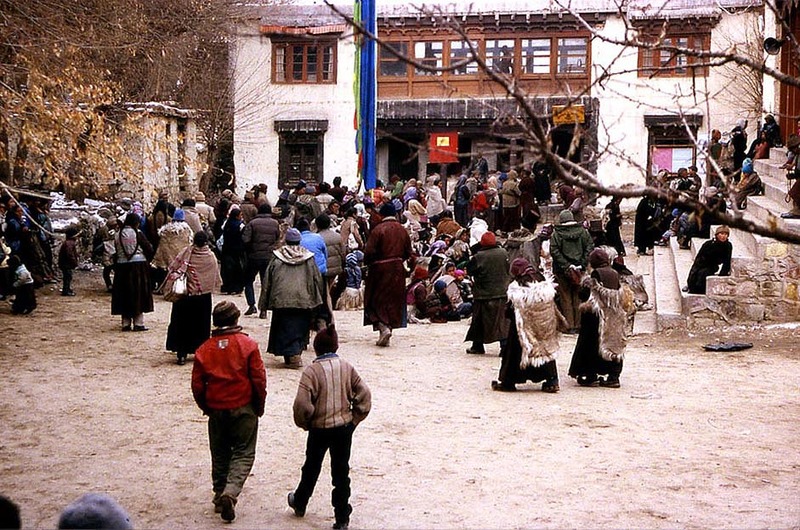 Oracles once were an important part of Tibetan religious and worldly life: All major decisions of the Tibetan government were based on the utterances of the State Oracle at Nechung near Lhasa, and many daily affairs were decided by the lesser oracles in the gompas. 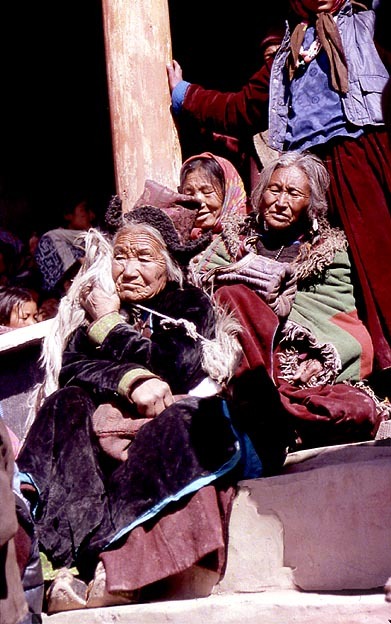 Nechung has long been shut down by the Chinese, and the State Oracle at Dharamsala has lost most of its power, so the long tradition at Matho and Stok has become an anthropological curiosity. We flew from Srinagar and because at this time of the year the air was cold, we encountered no difficulties or delays in the otherwise precarious landing at almost 3000 meters. 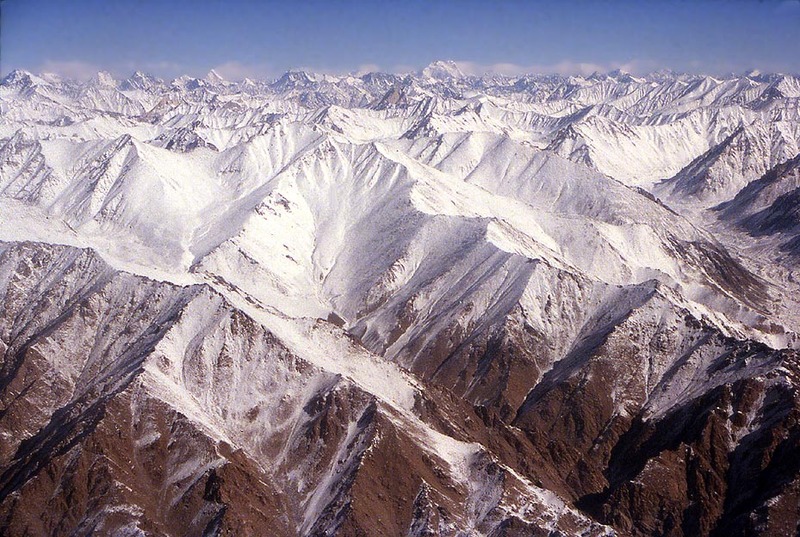 This photo is a view of the Karakoram flying above the Indus Valley. Despite that some of the mountains (K2?) in the background are 8000 meter high, this picture is much less impressive than the view of 5000-m-high Mt. Kazbeg! 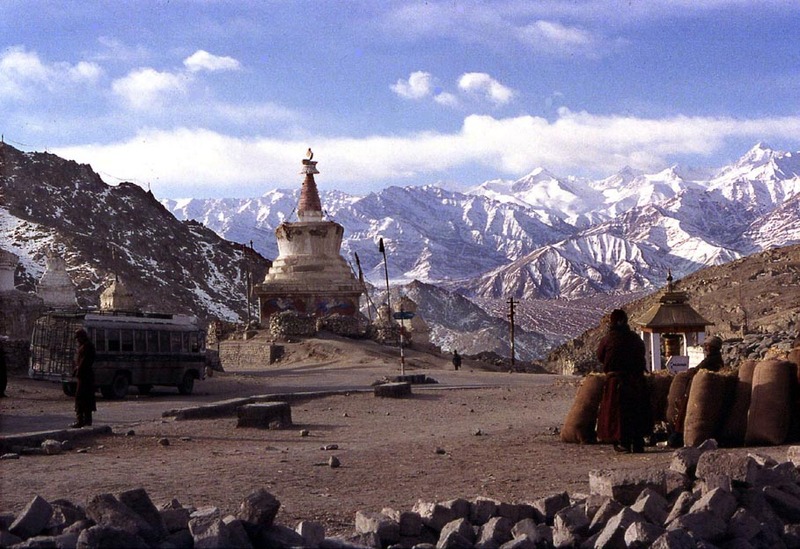 One sees that the snow line on the Tibetan side of the Himalayas lies well above 3500 meter. The sun is strong and the air thin, any snow sublimates tracelessly and quickly — which makes living at this altitude possible in winter. 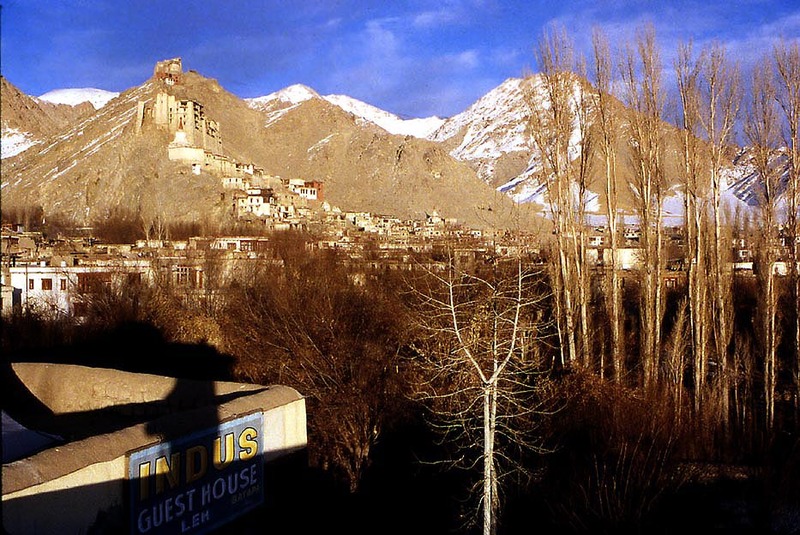 The familiar view of Leh and its Royal Palace from the roof of the Indus Guest House. Sonam Jacob and his niece Drölma who together operated the guesthouse in winter. Sonam is stacking and lighting our stove. 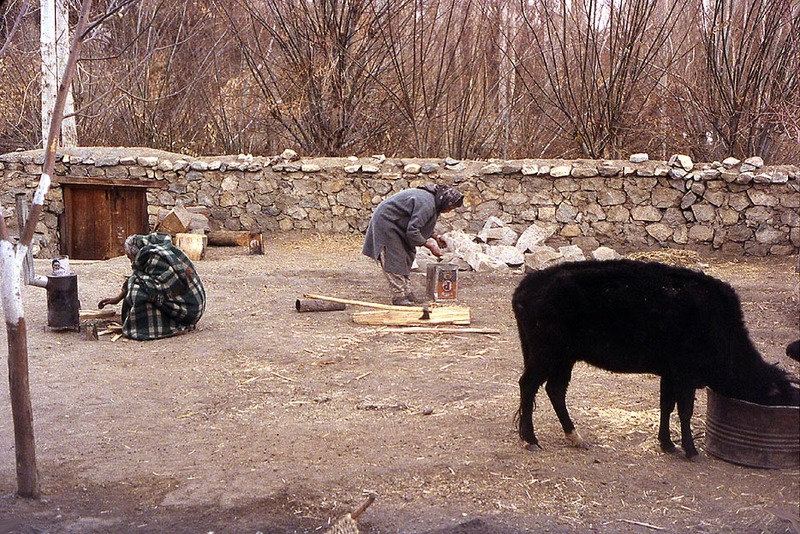 After the wood had caught fire he threw some briquettes on top and carried the smoking stove into our room. For the next two hours the thing glowed red, and we had to retreat into the farthest corner of the place. After another couple of hours the room temperature was back to 4 C (40 F).... But it was very dry, and we had brought excellent sleeping bags, thermal underwear, and down-overcoats, we did not freeze. Outside, the temperature was - 25 C (-13 F) at night, and in the sun during the day, when no wind was blowing, Barbara's thermometer went up to + 12 C (54 F)! Every third night we had a flickering of electricity, on other nights we read by candles. Our room. 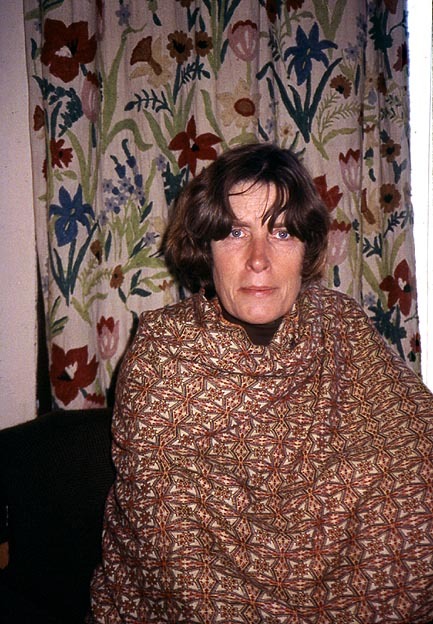 I had an agreement with Sonam that Drölma would deliver half a bucket of hot water every night. When the stove was glowing we would strip and wash each other standing in the warm water with a sponge, which I had brought especially for this purpose. After a few days Sonam began to complain that we cost him too much fuel. I offered more money, but it was not that, his propane supply was going down too fast. They bathed only once a year on Buddha's birthday, but that was all right, because of the dryness they didn't sweat — besides they were vegetarians. The dirt was but dust, and dust was good for you. The first thing the women would do with a new-born, they would smear him with earth-dust to get him used to it. 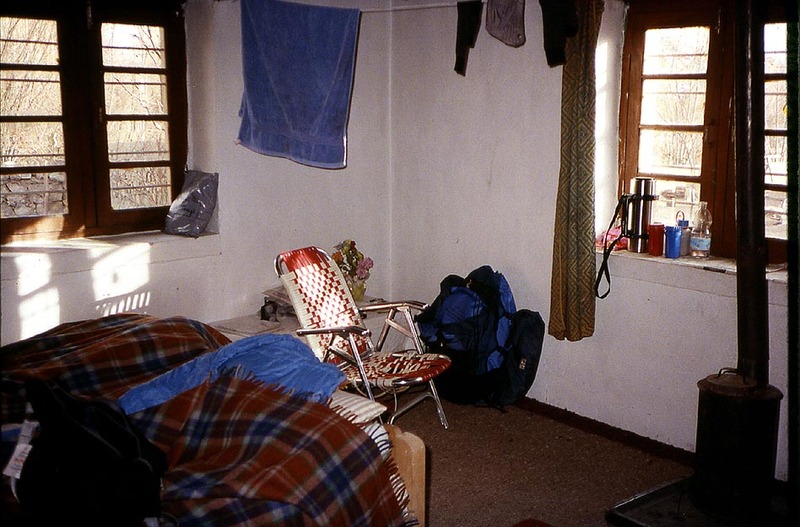 — Oh yes, we had a bathroom with a shower without water and a toilet into which we had to pour our bucket of warm water every day. No problem, the toilet froze again a little later. The solarium on the second floor. 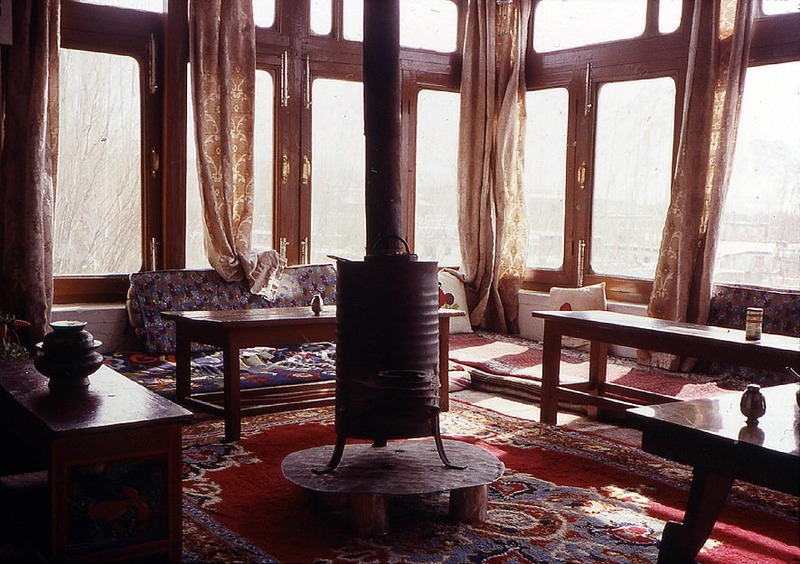 —Like in Tibet proper the common room has large windows towards the south. 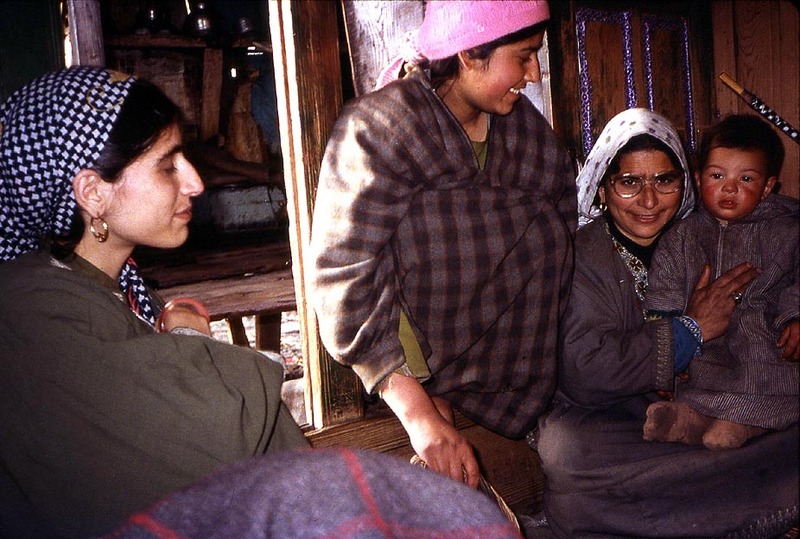 During the day it would get comfortably warm, at night for dinner Sonam lit a fire in the stove. Sitting on the floor at the low tables we had our meals here. Drölma did all the cooking on a simple propane-stove next to our bathroom. 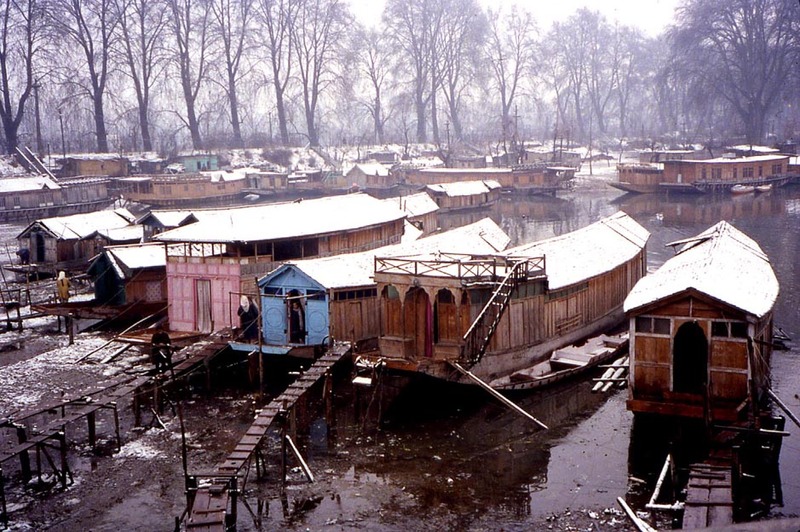 She replaced Sonam's Buddhist wife who with their children spent the winter in Srinagar, it was too costly to bring all food and fuel for the long winter months (November-June) from Kashmir. Sonam had a supply of cauliflower, potatoes, carrots, and cabbage laid down in the frost-free basement, and supplemented by rice and colored by various spices Drölma would manage a different meal every night for the four or six guest of the house. 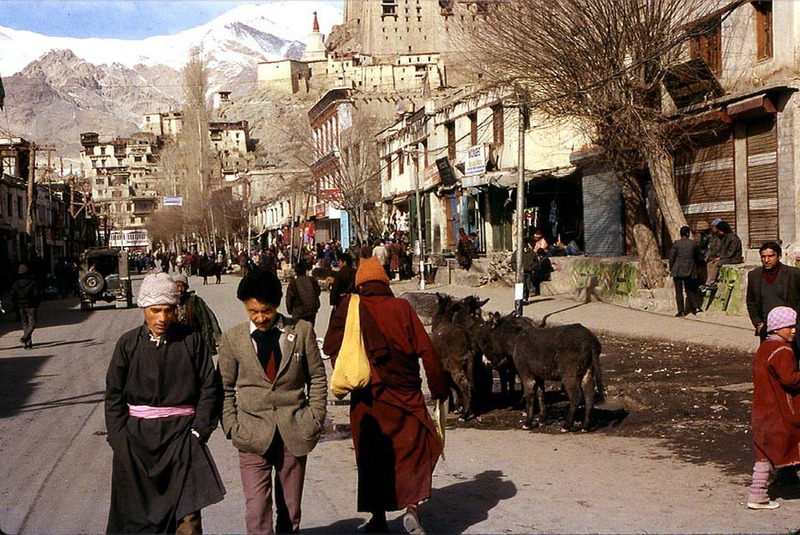 Main street in Leh. 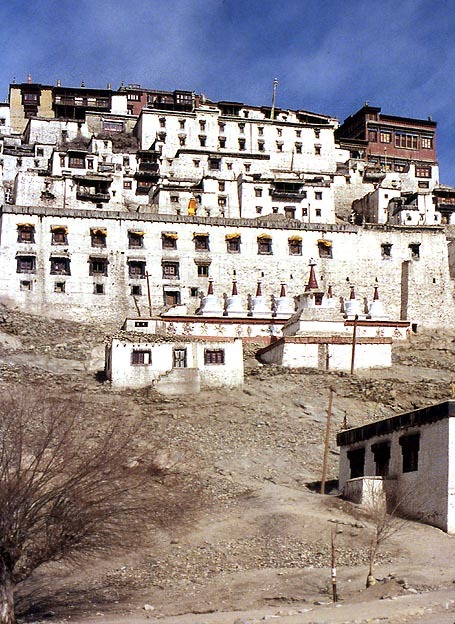 The mosque is at the end of the street, the gompa left around the corner, and the deserted royal castle rises above. At the other, eastern end of town and main street is the "caravansary" — the bus station and the town chörten. 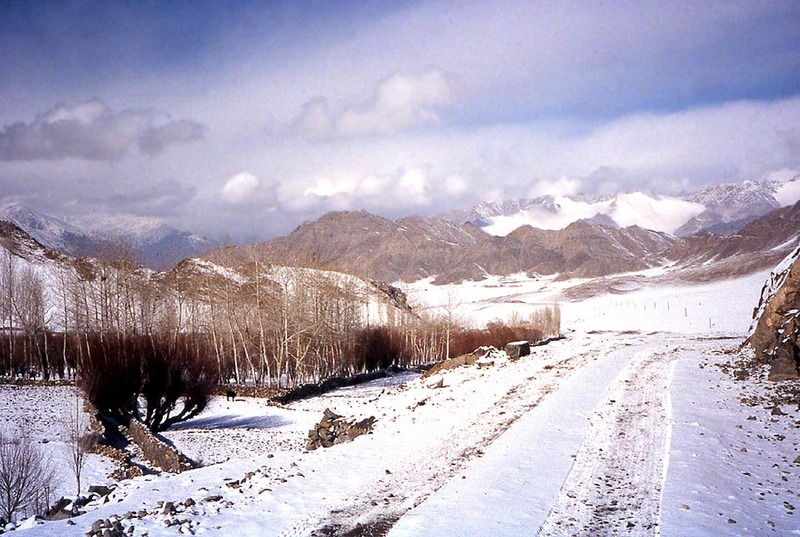 The Ladakh Range is seen in the distance to the south across the Indus Valley. 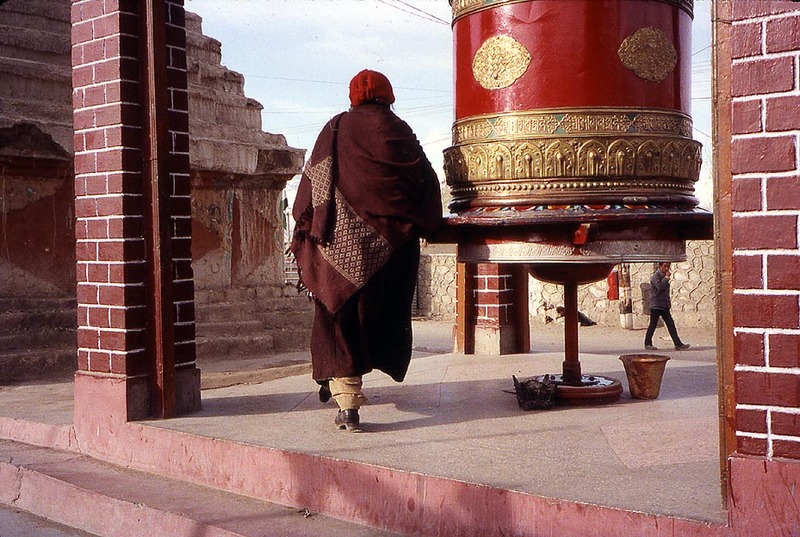 The big prayer wheel. The bucket contains motor oil which the faithful poured onto the bearing to keep the cylinder turning easily — thank God, it doesn't have an electric motor drive yet. 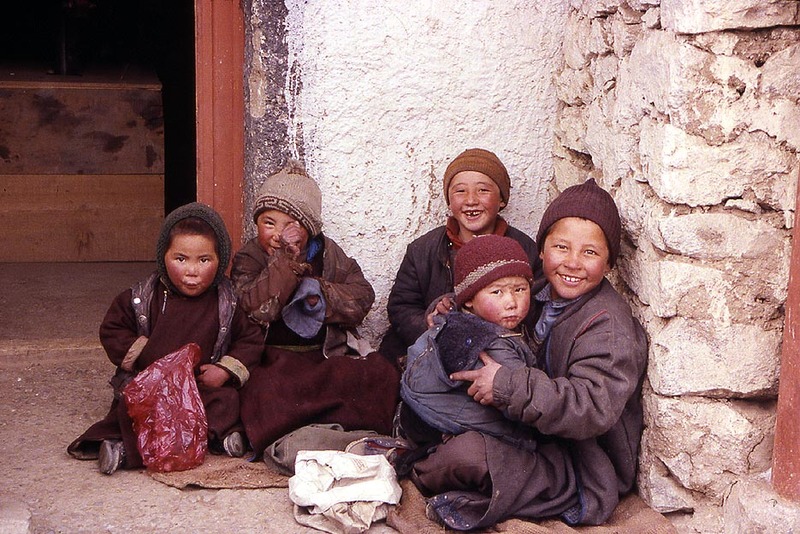 Children along the path to Sankar, a meditation retreat near Leh. 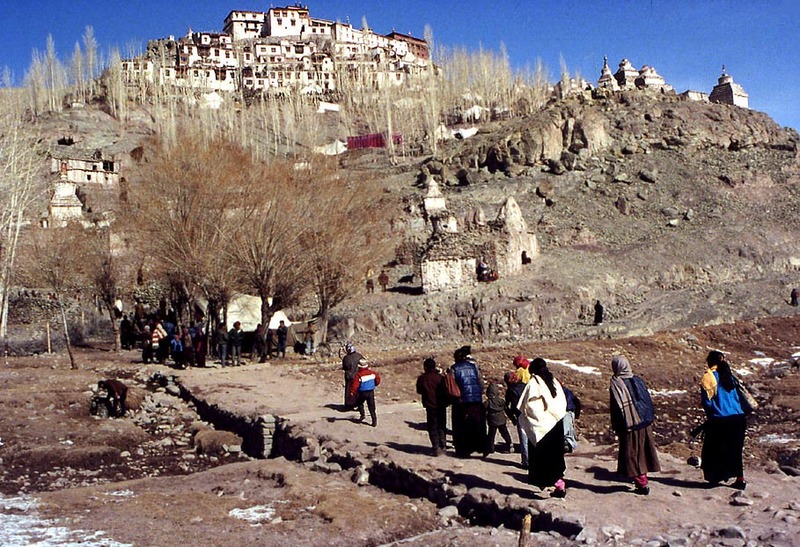 Once a year the children of Leh beg in large numbers along this path. 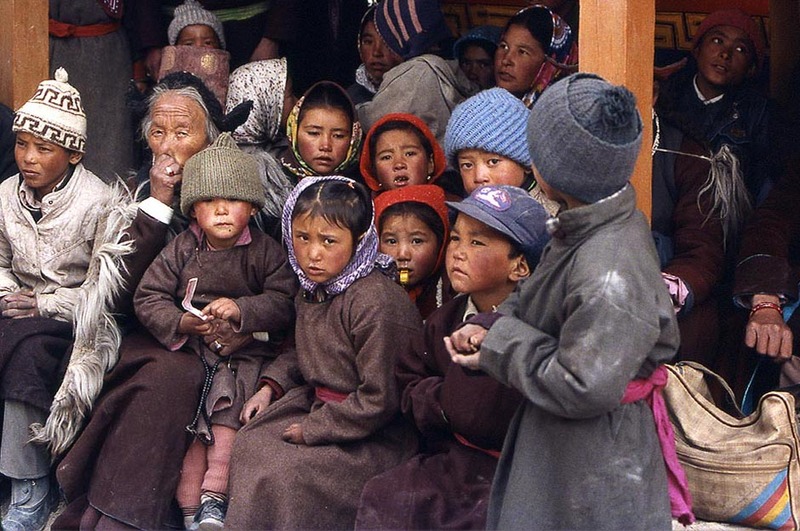 When one approaches, they begin to sing fervently "O mani padme hum! O mani padme hum!...." and cheer loudly if one gives them a couple of rupies or sweets. These were quite secular rascals playing Trick-or-Treat. 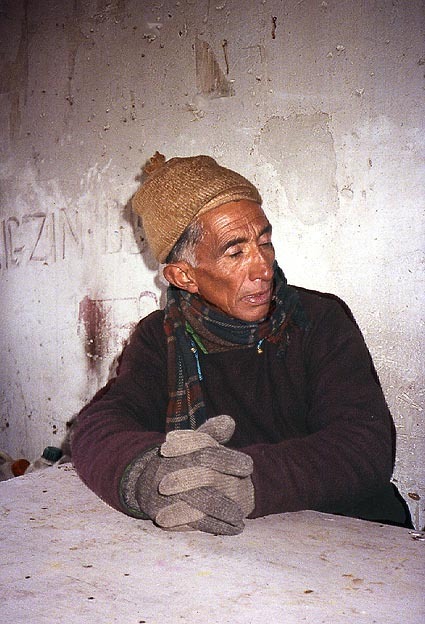 Ali Sayyed Shah, the graceful, old photographer of Leh at the Moslem restaurant below the mosque of Leh. 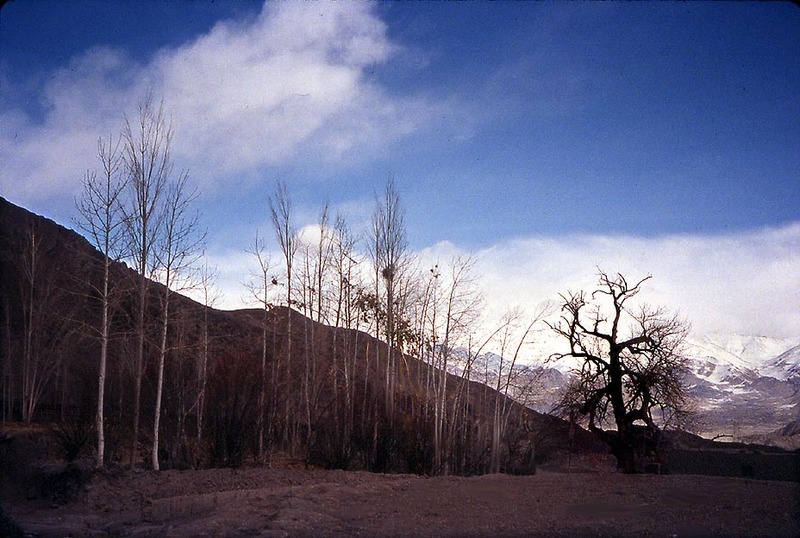 Ali was born in Kashgar, the son of a merchant of princely Arabian descent. 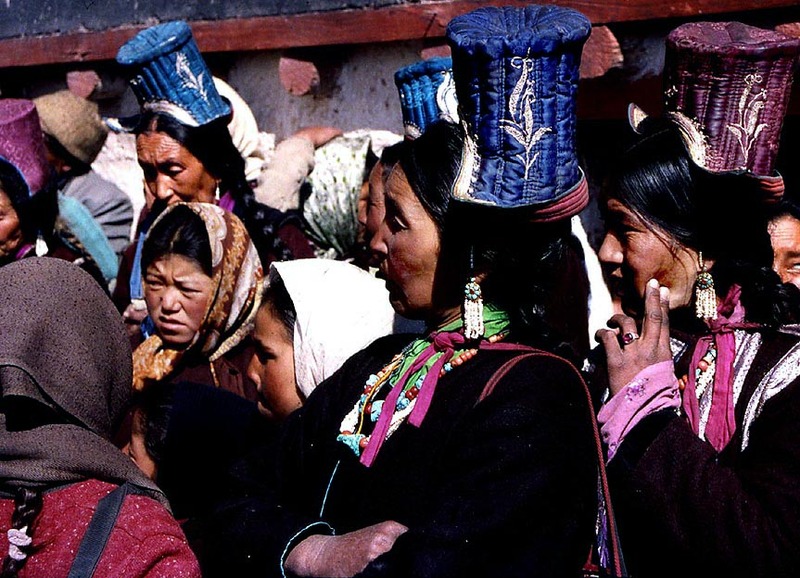 As a young man he had worked as a photographer for Sven Hedin (he showed us a series of photographs of S. H. in Leh) and later for Shipman, the British consul in Kashgar. 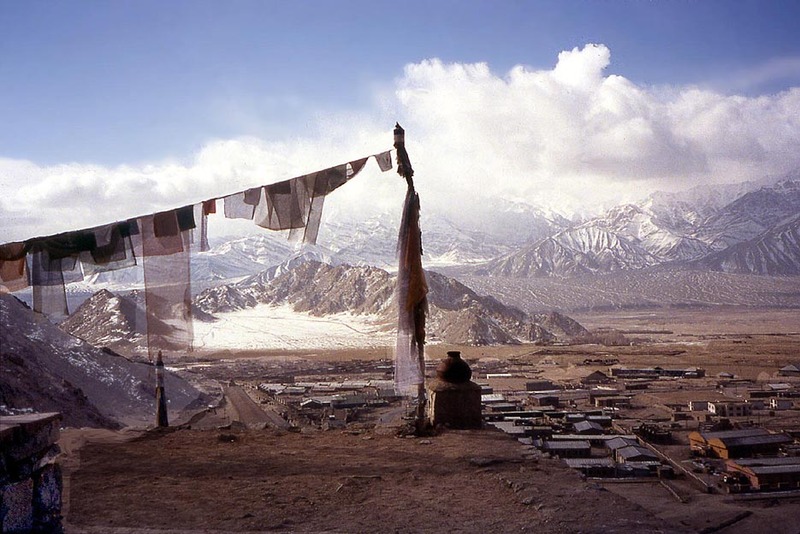 During the bloody Uigur uprisings against the Chinese in the fifties he fled over the Karakoram Pass to Leh and never saw Chinese Turkestan again. He took us to his dark "studio" in the quarter behind the mosque, where we were allowed to rummage through boxes filled with priceless photographs of fifty years. 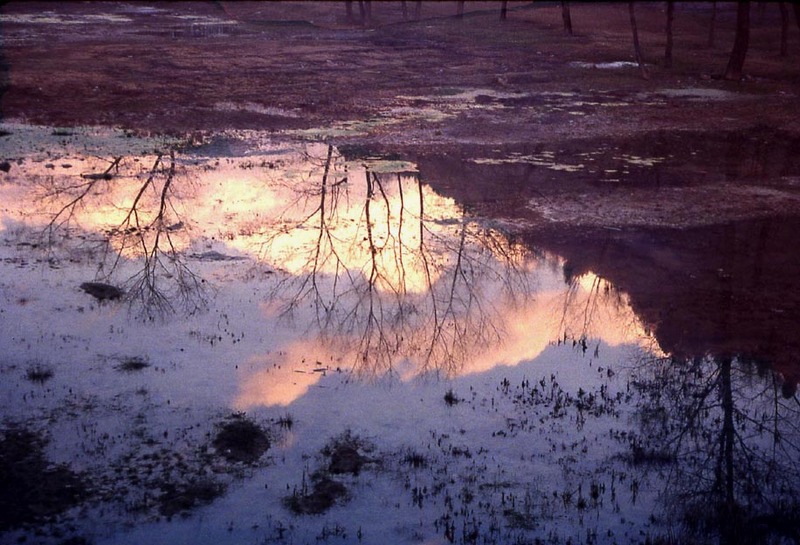 I bought a few and Barbara sent them as postcards to friends, but one should have negotiated for his glass-negatives, rare images which the people at the Getty Foundation would have loved to own.... Now he has probably died. One day Barbara climbed the castle peak. She got me as far as the castle's pediment from where this view east was taken. 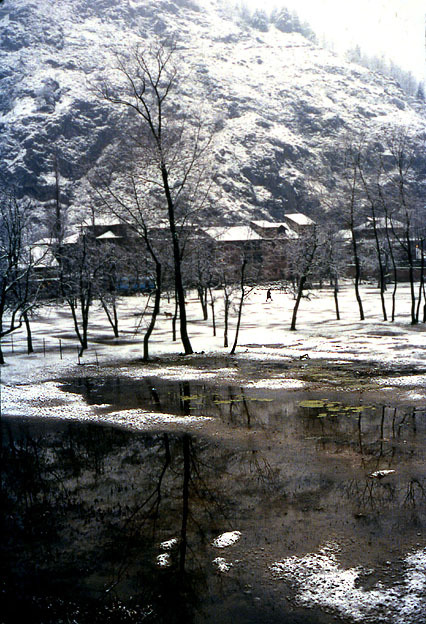 The night had been overcast and the town was covered with snow on the following, very cold morning. The busses had to be revived by lighting fires under their gear boxes and engines. 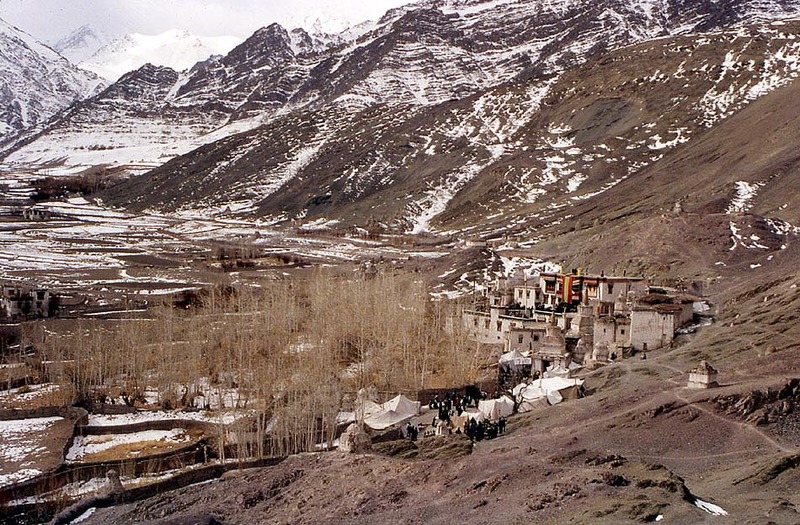 We decided to go to the village of Sabu and walk back to Leh. 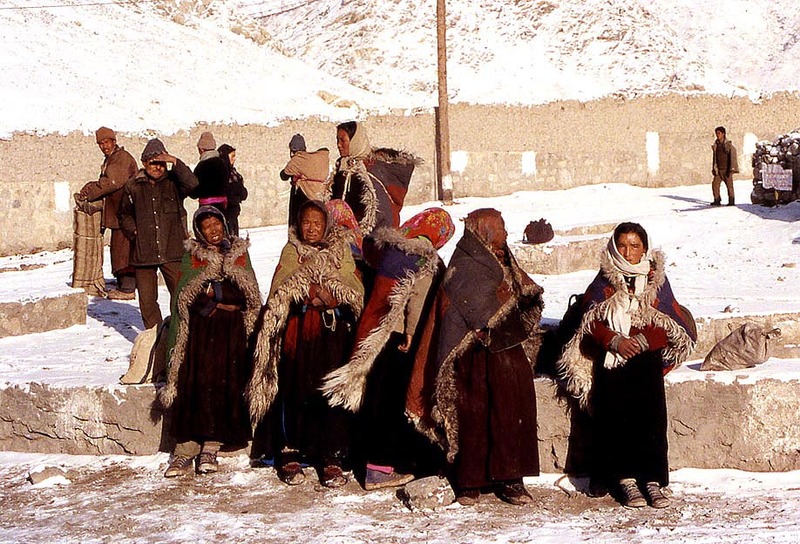 Women waiting for the bus in the first sun. ...except for the tracks of the bus we had come with. 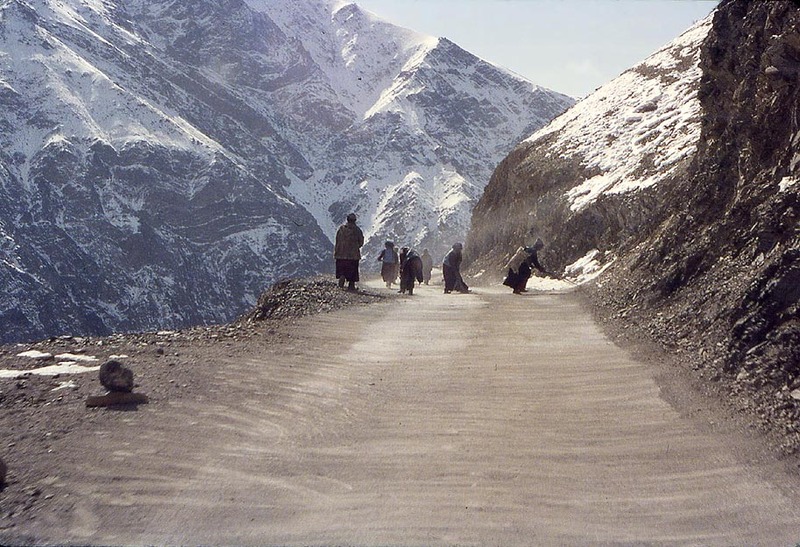 We walked all the way down to the main road along the Indus where another bus back to Leh eventually picked us up. 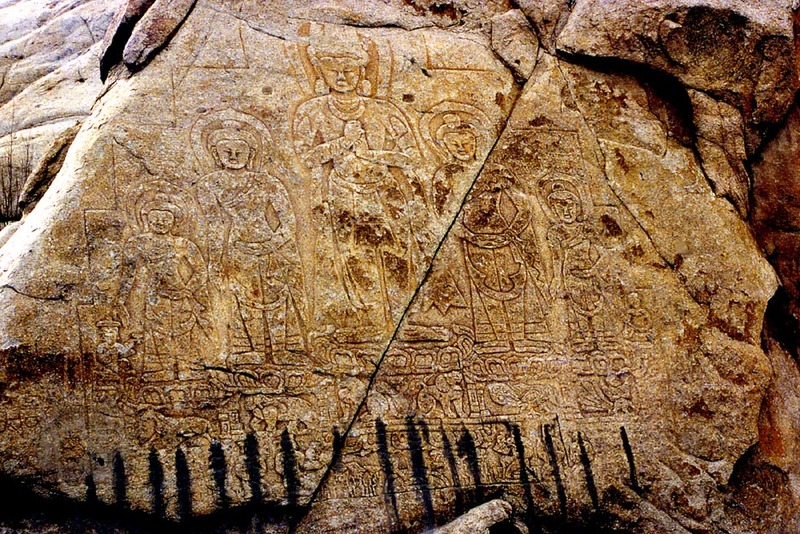 On the way to Hemis the main road skirts the rock of the royal castle of Shey and this relief of the five Tathagatas or Djani Buddhas. 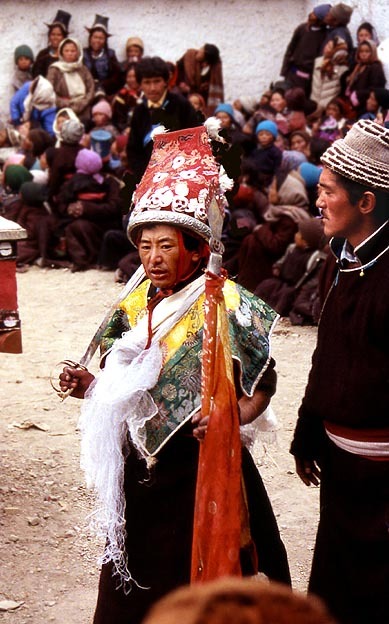 It originates from the 10th century, the time of the second Buddhification of Tibet which proceeded from Kashmir through Ladakh, Thöling and Tsaparang to Central Tibet. I had long wanted to have a closer look at this rare monument of the early Mahayana, and so we got off the bus and walked back across the sacred Nyarma Cremation ground between Shey and Tikse. 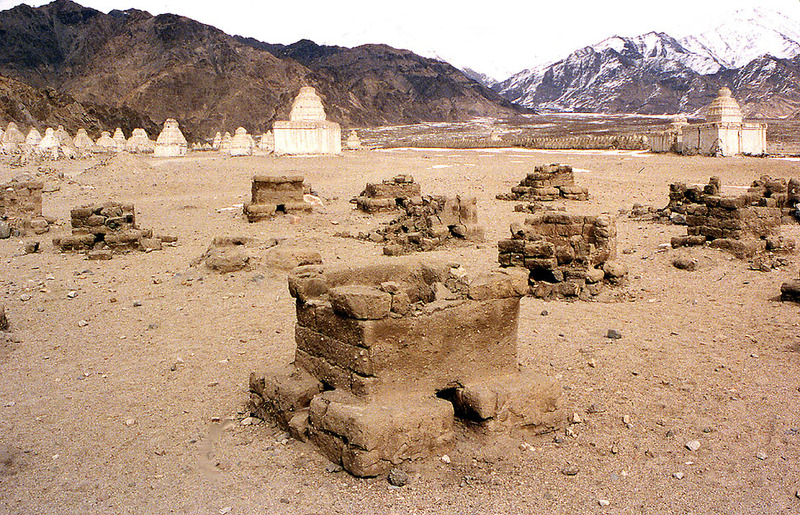 The cremation ovens at Nyarma below Tikse. 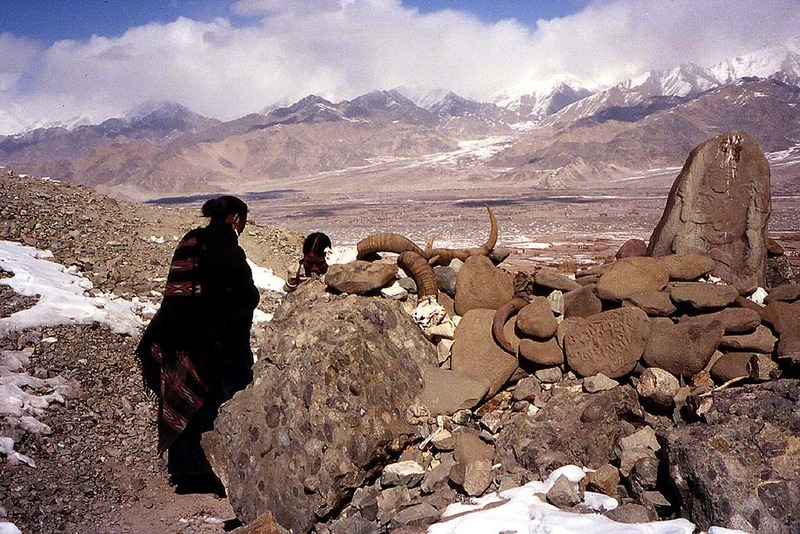 Different from Tibet, where the dead are fed to vultures (Sky Burial), they are cremated in Ladakh. The corpse is bound to a wooden sedan chair in sitting position. To save precious wood the chair is placed over the fire in the oven. Burial costs, which naturally also include a feast for relatives and friends, are covered by societies to which the deceased and his family had belonged during his life time. 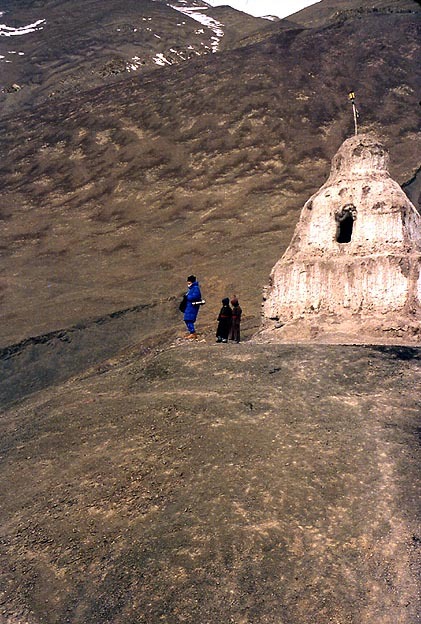 The ashes of the deceased are mixed with clay by the monks, formed into dozens of tsatsas — miniature, conical stupas, stamped with a relief of Amitabha at the bottom, and stored in one of the chörten in the background, from which they spill, if the chörten is broken open. 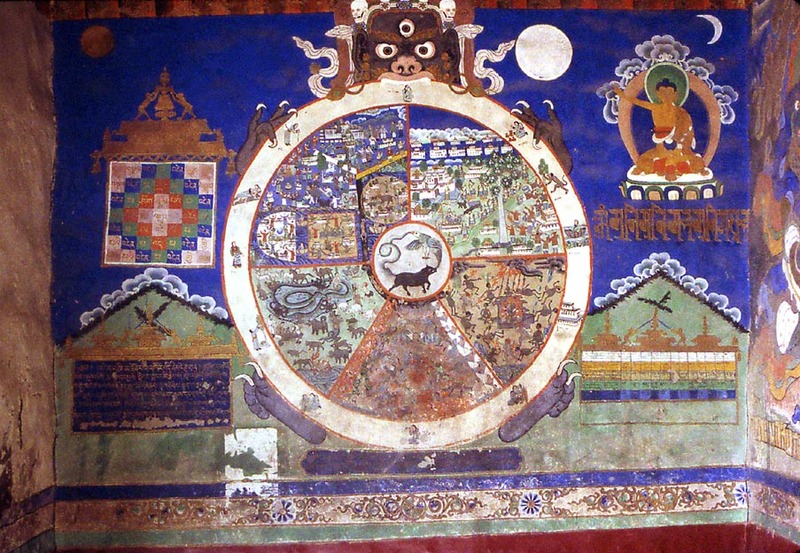 Nyarma was a famous Buddhist university which played an important role in the reintroduction of Buddhism to Tibet during the middle of the 11th century. ...and this exemplary Wheel-of-Life greets the visitor at the entrance. 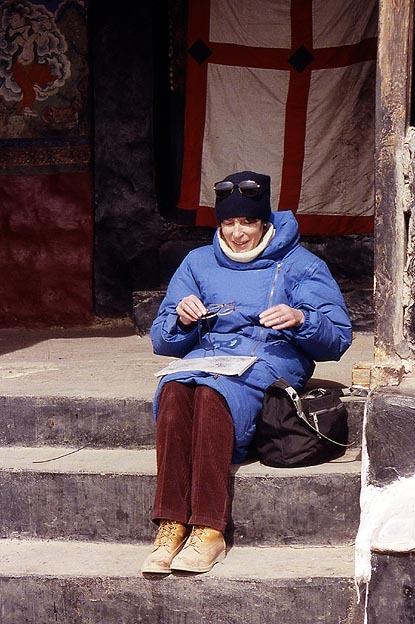 Barbara warming herself in the sun, reading our notes on Ladakh. An old Amitayus stele in the Tsokhang of Tikse. 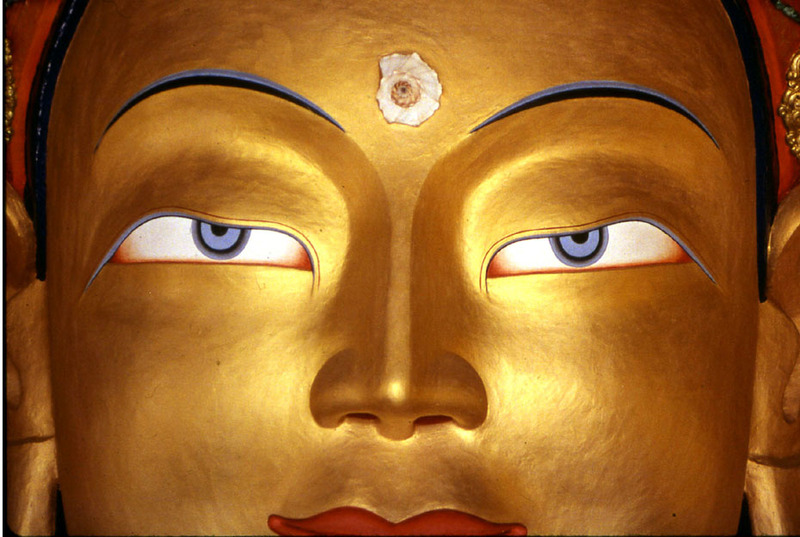 The head of the new, gilded Tikse Buddha — which is two meters high. On the second story one stands immediately in front of his blue(!) eyes. — Click on the image to get a feel for the experience. 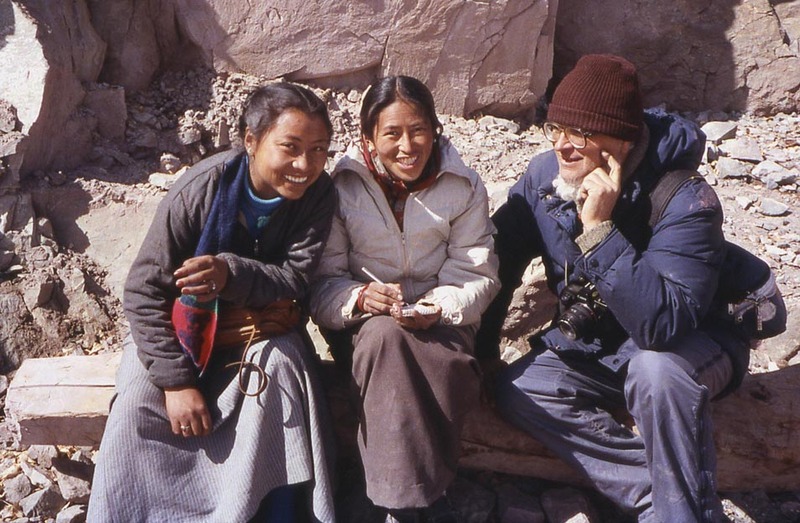 I wanted to take Barbara to Alchi and to Lamayuru and after a long negotiation over the price hired Faisula and his taxi to drive us and two other foreigners (whom I persuaded to share the price). Being Moslem Faisula has a Buddhist wife. We met her among their five naked children in a small adobe house at the edge of town. 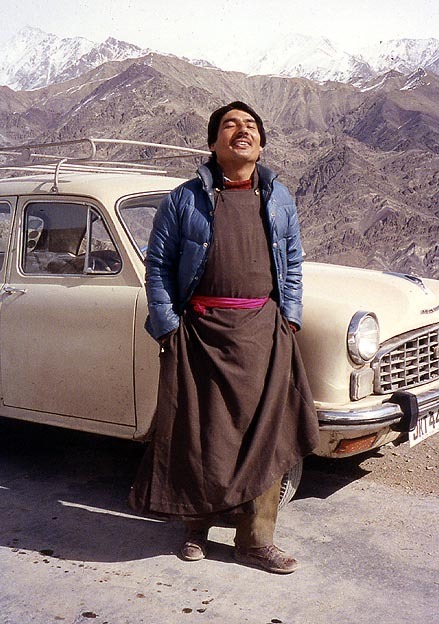 He turned out to be a most cheerful companion, telling us many stories about his and Ladakhi life. 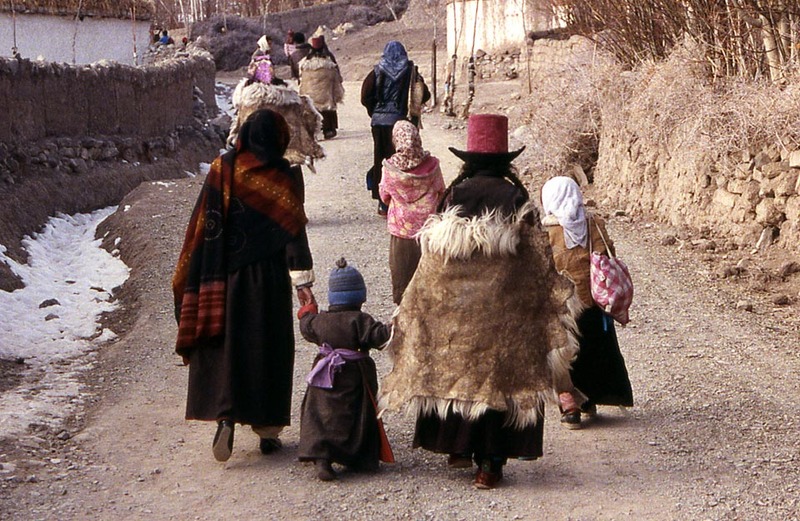 A group of women "repairing" the road to Lamayuru under the supervision of one man — who didn't move a finger to help them. 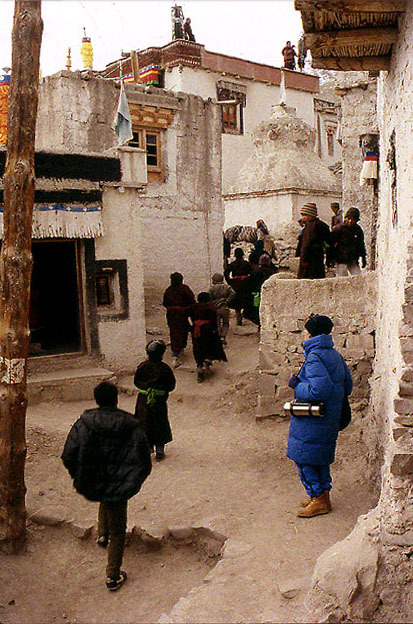 A band of ragamuffins roaming the village next to Lamayuru Gompa. 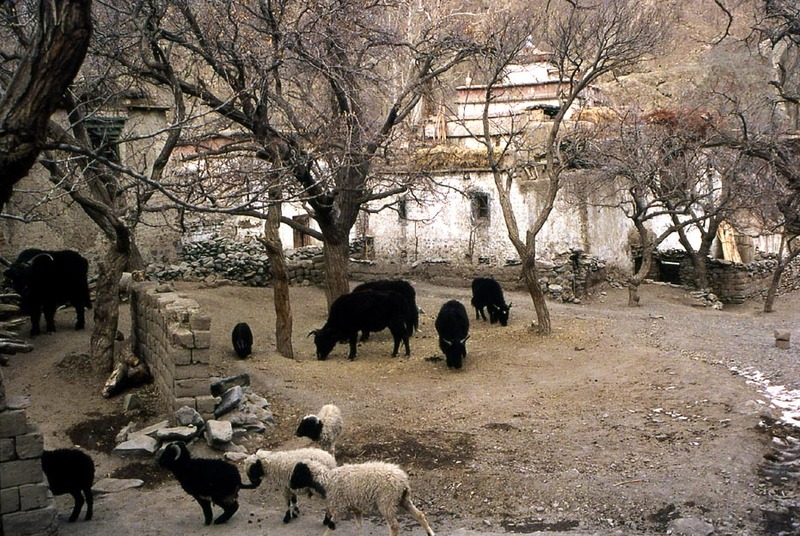 The Sumtsek of Alchi in the charming yard. 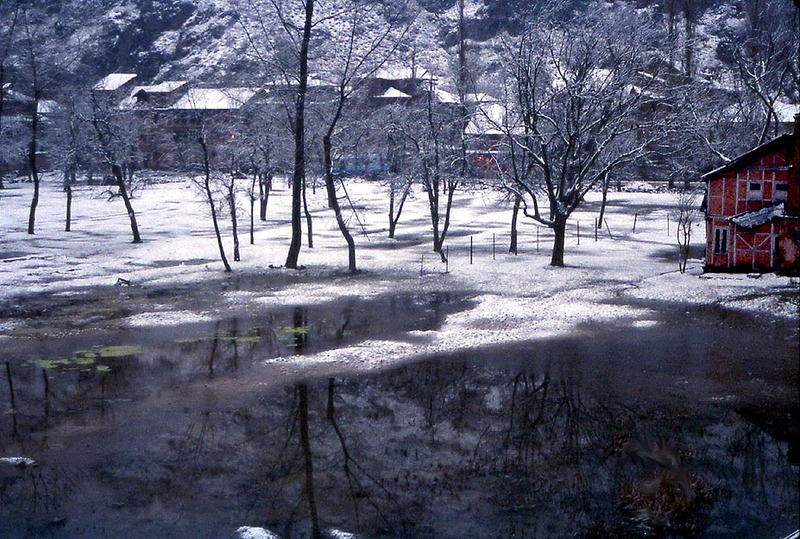 The German tour-groups being gone, it served as winter refuge for animals and their newly arrived off-spring. Unfortunately Barbara was so cold by the time we reached Alchi that she hardly remembers any of the beautiful murals in the Sumtsek. 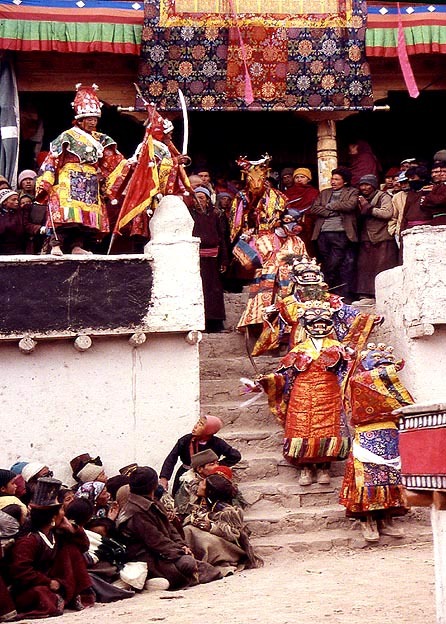 The day of the Matho — the only Sakyapa gompa in Ladakh — Nanrang, the Cham Dances with the oracles, was beautiful and sunny. Hundreds of pilgrims from all parts of the valley walked up the steep hill in the morning. Barbara taking a breather on the ascent. The thermos filled with hot tea saved our life many times on our wanderings. Two young Ladhaki girls eagerly discussing their life and expectations with us. Redoubling our patience and resolve a week later we took a taxi to Stok on a cold and overcast day. 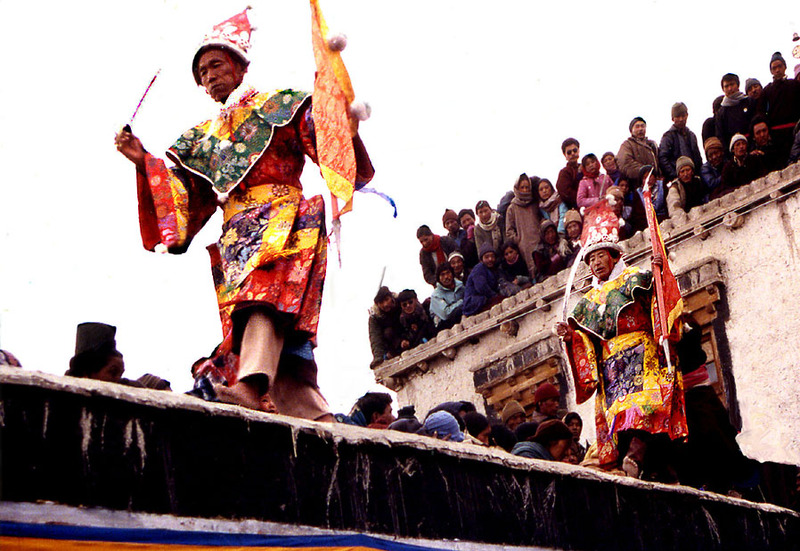 Young monks on the roof of their housing preparing for the dances. Two Yellow-Hat clarinet players. 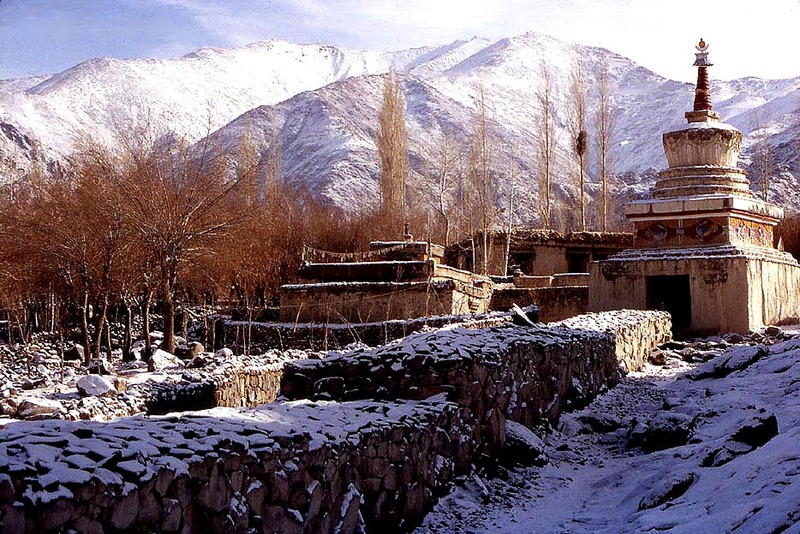 Stok, the monastery near the present abode of the last Queen of Ladakh, is a reformed Gelugpa institution. 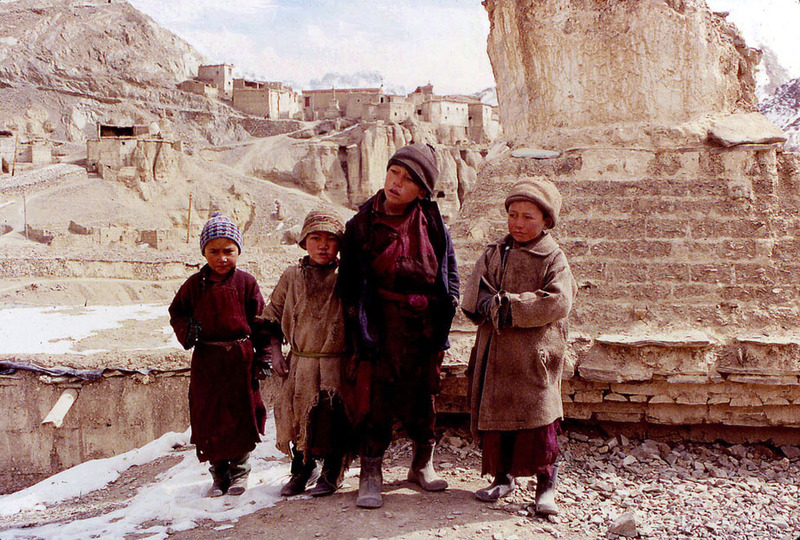 Children in the monastery yard. 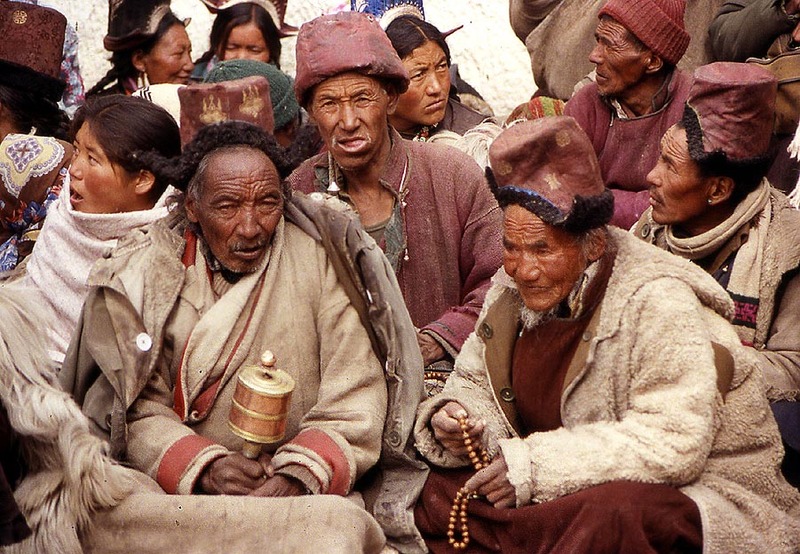 ... and group of old beggars who walk from festival to festival. 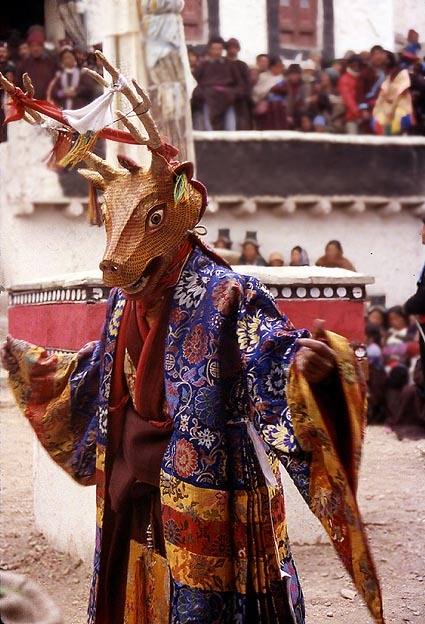 In the Stok Guru Setchu — the Mystery Play is, like in Hemis, honoring Guru Padmasambhava's conversion of Ladakh to Buddhism — appear several characters who are not part of the cast at Hemis: Their most prominent is a richly dressed Stag, framed in the photo by Yama the personification of death and Pehar(? 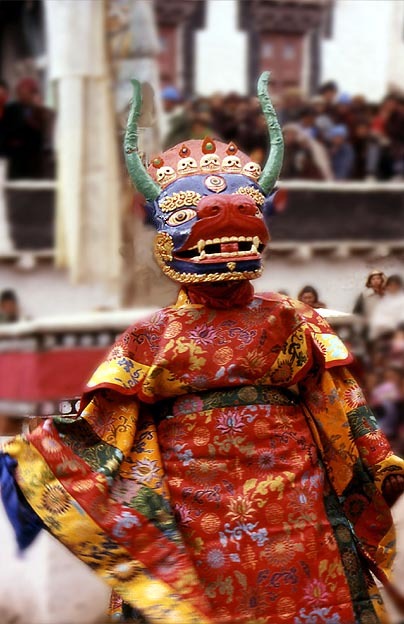 ), as a fierce manifestation of Padmasambhava. 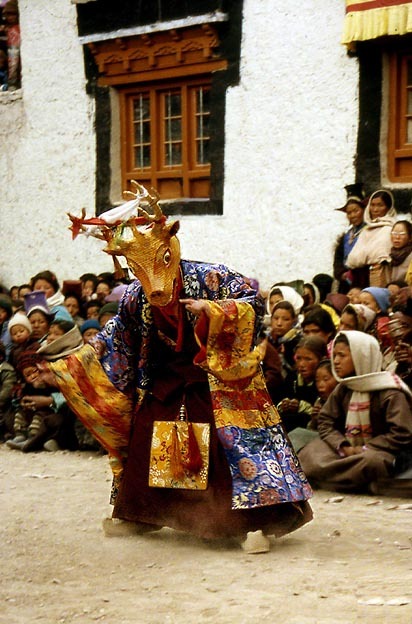 The Stag is probably (I have never found an expert description of the Stok dances) a beneficial manifestation of Padmasambhava, because in Stok (and in other Mystery Plays elsewhere in Tibet) the Stag will cut up the Linga on the first day. 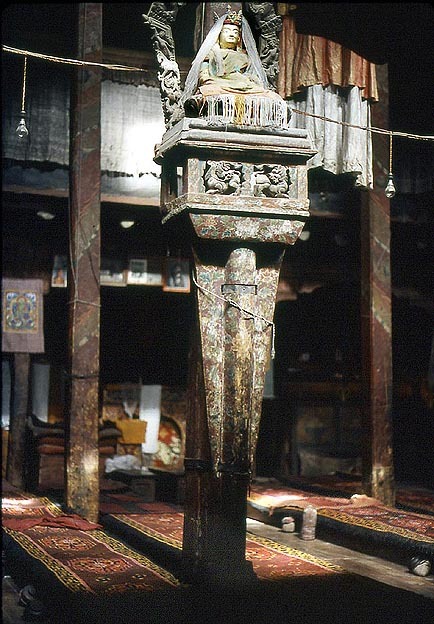 The Stag is undoubtedly a hold-over from pre-Buddhist, shamanic Bön rites, possibly of Central Asian origin. 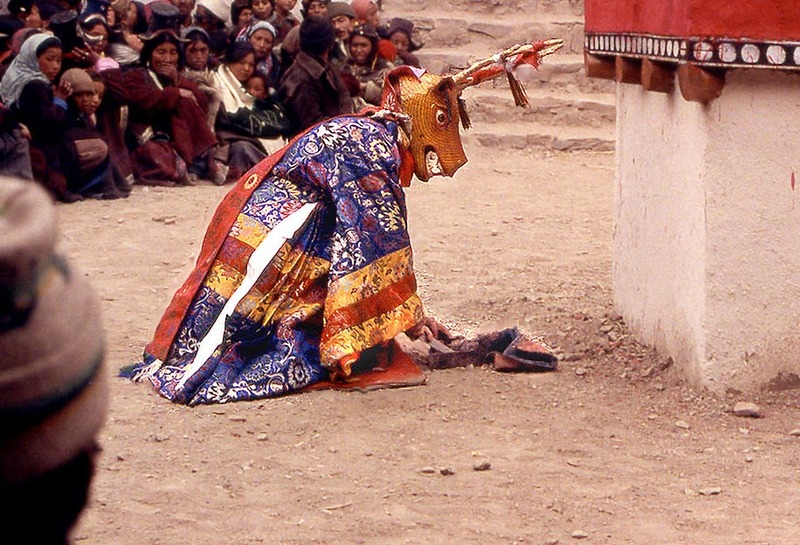 ...which he cuts up with a phurbu — the magic dagger of Padmasambhava. 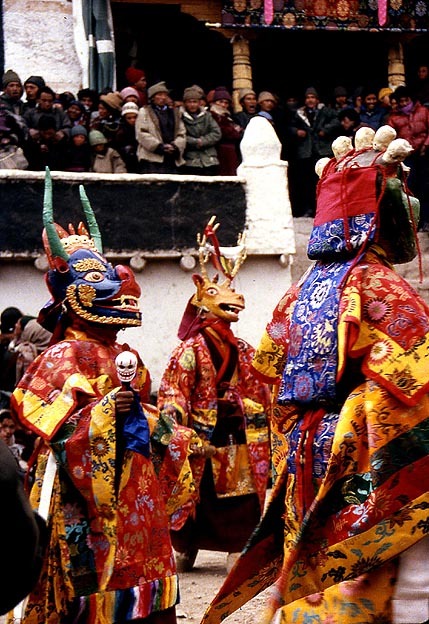 After this act — or so I remember — is an intermission during which the masks retreat into the Tsokhang for a lengthy chanting service. A lonely Lama meditating in the Dukhang. 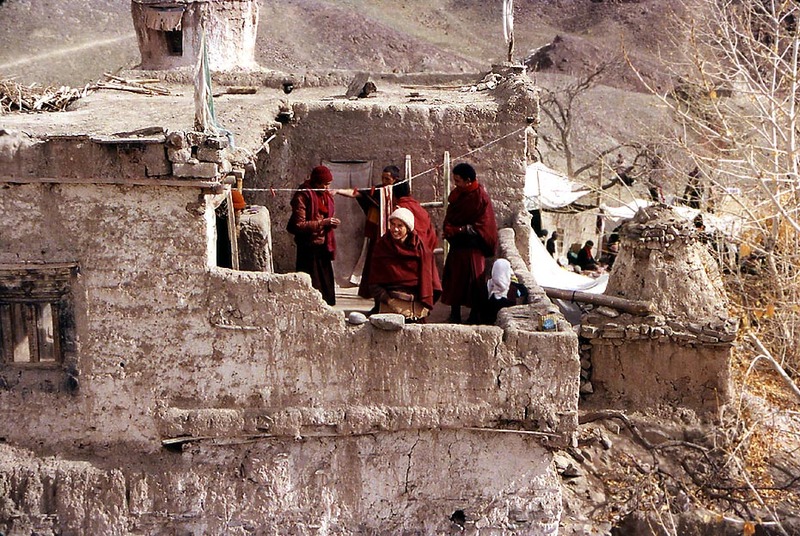 Barbara at a chörten above the gompa being watched by two curious children. After the intermission the masks re-exit from the Dukhang — and the two oracles first appear (on the left). In trance or half-drunk they begin to run around shouting cryptic prophecies of the future — and, as one local explained, wild obscenities. Everybody gasps and ducks. 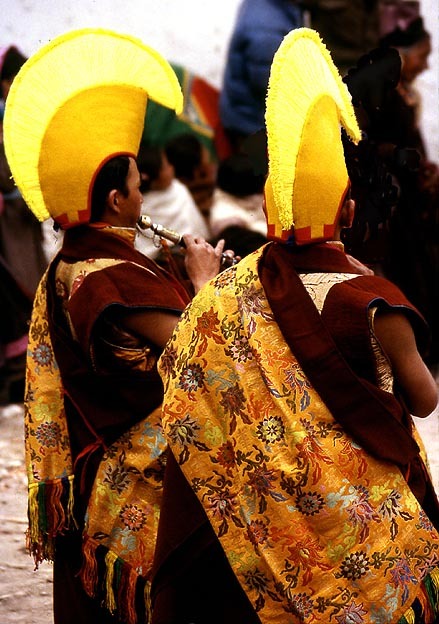 The two are well-known men from the village, who have been performing this role for decades. They have spent several weeks in solitary meditation. 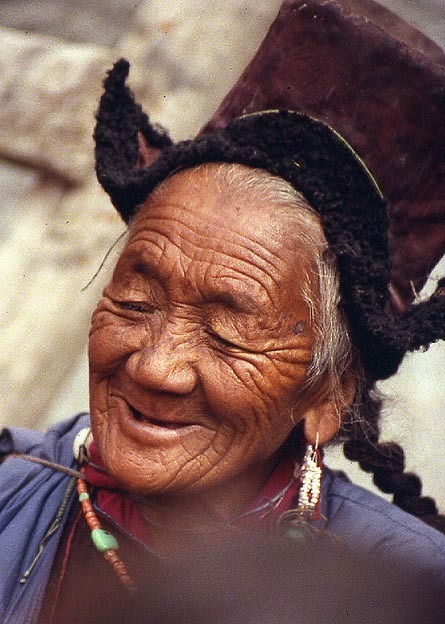 Supposedly liberal amounts of chang — Tibetan barley beer also play a role.... The older oracle carries a curved saber with which he hits anyone who does not flee from his path. To the great cheer of the bystanders I was hit, with the saber's broad side, twice in the hour that followed. My heavy down parka protected me. The younger of the two men. Each has a retainer who follows the oracle to prevent him from physical harm. In one scene, to the sighs of the audience, the older oracle cut his tongue — without drawing blood. The two run precariously close to the edges of the roofs of the monastery and jump from roof to roof, always anxiously followed by their retainers. 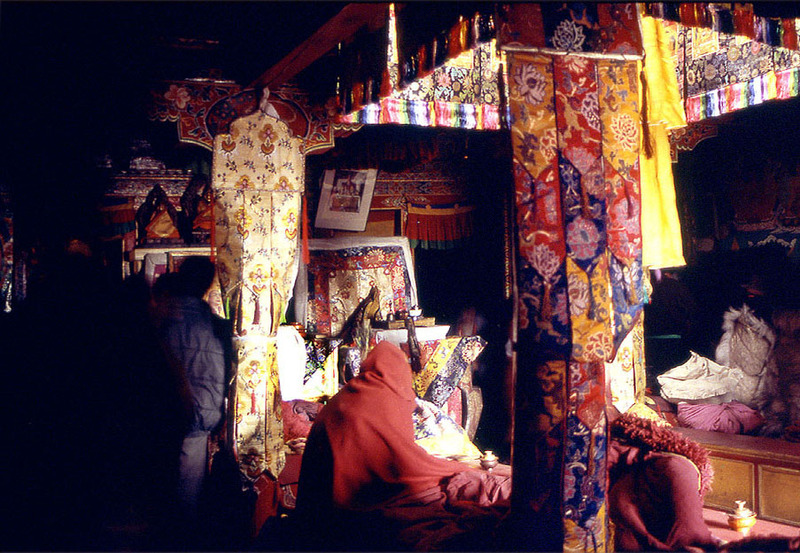 On the second day the oracles run from lhato to lhato — sacred trees and chörtens — in the countryside surrounding the gompa.... We did not return for the second day, we were too cold when hitch-hiking on a crowded truck we reached Leh and our room that night. ... and a resigned Yama preempted of his power. 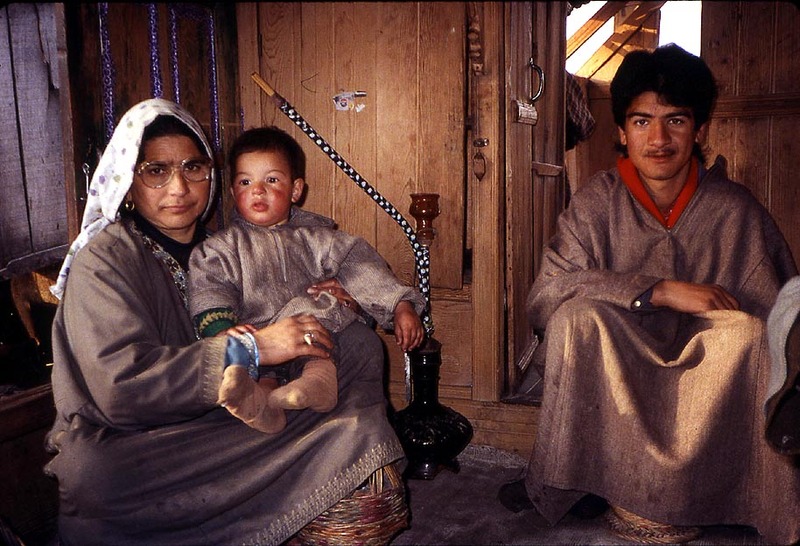 After two weeks in Leh — Sonam grumbling why we stayed so long, his other foreign guests had long left — we flew back to Srinagar without any problems. ...The beautiful daughter, whom I had destined for Cornelius, had turned into a resigned married woman but had produced a son, who sits on his grandmother's lap. The daughter, in an aside, meekly begged Barbara for some perfume... A sad case.